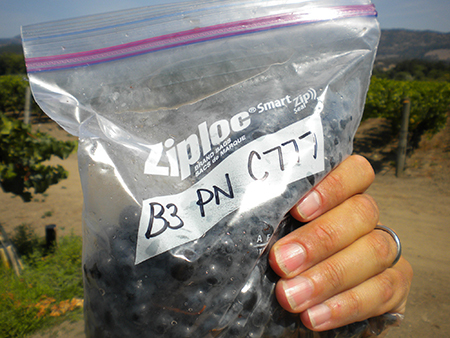 I've spent a lot of time trudging around the vineyards with little plastic baggies lately, mostly collecting grape samples and checking out the fruit as it gets closer and closer to harvest. For that matter, I've spent a lot of time trudging around vineyards my whole life, although when I was a kid, it was usually with a skateboard in hand, and with less wholesome motivations than crafting tasty beverages from pristine clusters of shimmering fruit. I've grown very fond of plastic baggies over the course of the last 25 years. They always seem to be oriented something that is appealing to me. Over the course of my life, I have tended to associate good things with plastic baggies. As with most aspects of life, my tastes have evolved. I used to be content with the thin sandwich baggies and would be really happy if it was two-fingers deep. Now, my tastes have shifted and I prefer the zipper style freezer quart bag. With age comes higher expectations, so I now fully expect to see four-fingers of product in my baggies. I also don't like to find herbal or green aromas in my sample baggies now, although 20 years ago, this was appealing. As the harvest slowly approaches, we have been very busy bottling wine, finalizing barrel orders, and starting to walk the vineyards more often pulling grape samples. This time of year is always very exciting with the fruit in the vineyard approaching ripeness, the activity in the cellar at full tilt and football season starting up. My sons team (7-9 year olds) won their first game of the season Saturday and the 49ers sealed the home opener in exciting fashion with a couple of touchdowns in the last six minutes of todays game. 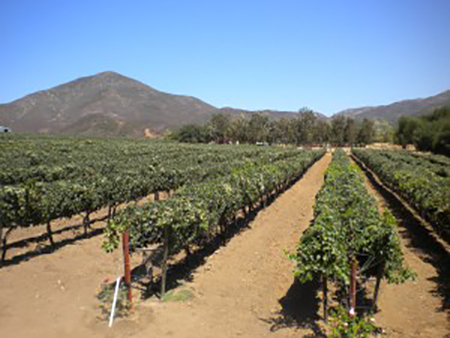 Adding to my personal harvest adrenaline, for the last five years I've been consulting on an wine project in Valle de Guadalupe of Baja, Mexico. It has been a wonderful project to work on as I have had the opportunity to work with fruit in a very different region than I am used to here in Napa. I think this has helped me improve my skills as a winemaker and helped to broaden my perspective, both as an individual and as a winemaker. The people involved in the winery are fantastic. They are a friendly, welcoming, family-oriented group. The owner is the British Consul for Northern Mexico. My south-of-the-border winemaking office in Tijuana is sandwiched between the British Consulate and a whiskey bar. Thats the way they roll in TJ. 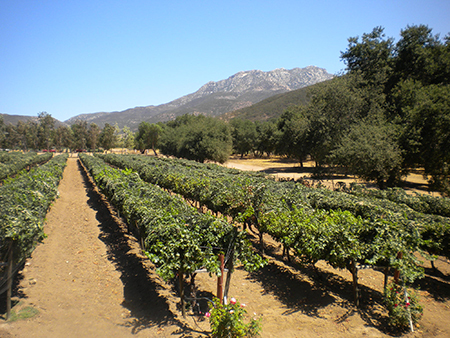 I was just down last week to check on the grapes in the Valle de Guadalupe. Its not unusual for us to travel in the consulates armored Jeep Cherokee, which looks like a beater from the outside, but is fully replete with armored doors and bulletproof windows. You'd never know it seeing it from the sidewalk. About halfway to Valle de Guadalupe on a very hot Thursday last week, the engine started overheating. We had to shut the AC off, which meant we were now hurtling through the hot afternoon in an armored incubator with 1/2 inch thick windows that couldn't be rolled down! We were blazing. Just up the road was a military checkpoint. The strategy was show them the British diplomat plates and let them draw their own conclusions about the gringo (me) in the backseat. We went through unquestioned. After a few hours walking the rows and sampling grapes at the vineyard, during which time we got the Jeep all fixed up, we made our way back to the winery facility in Tijuana. To my surprise, the winery had a mesquite grill going with carne asada, fresh made pico de gallo and a few bottles of 2007 Pinot Noir, the first wine we bottled down there. They had made me a special lunch for my 40th birthday, which was a complete surprise and greatly appreciated. The power went out about halfway through our party, which we found out shortly was part of a much larger blackout that covered parts of Arizona, southern California and northern Mexico. All the flights that evening were cancelled, so we made arrangements for me to stay the night in Tijuana. Although I had just scheduled to be down for the day, it ended up a being a very productive and enjoyable two day trip. My crew at Monticello managed our activities up north without grief. I've worked at Monticello my entire life. This will be my 22nd harvest at my family's winery in Napa, the last ten as head winemaker. We are very busy at Monticello, and I'm not looking for more things to do, but something really struck me about this project in Mexico. It was such a unique opportunity, and I was very impressed with the quality of the vineyard and the nature of the people involved. It has been as satisfying as I had imagined and a reminder that, ironically, every now and then we need to break our rhythm in order to keep our rhythm. Here's to a great harvest!